This series is directed to healthcare professionals who are leading the transfor- tion of health care by using information and knowledge to advance the quality of patient care. Launched in 1988 as Computers in Health Care, the series offers a broad range of titles: some are addressed to speci?c professions such as nursing, medicine, and health administration; others to special areas of practice such as trauma and radiology. Still other books in this series focus on interdisciplinary issues, such as the computer-based patient record, electronic health records, and networked healthcare systems. Renamed Health Informatics in 1998 to re?ect the rapid evolution in the discipline now known as health informatics, the series continues to add titles that contribute to the evolution of the ?eld. In this series, eminent experts, serving as editors or authors, offer their accounts of innovation in health informatics. Incre- ingly, these accounts go beyond hardware and software to address the role of information in in?uencing the transformation of healthcare delivery systems around the world. The series also increasingly focuses on "peopleware" and the organi- tional, behavioral, and societal changes that accompany the diffusion of infor- tion technology in health services environments. Illustrations note 33 Illustrations, color; 27 Illustrations, black and white; XVIII, 486 p. 60 illus., 33 illus. in color. There continue to be enormous changes and advancements in the indexing and retrieval of online health information, fueled by the growth of the Internet and World Wide Web. This has enabled the field of information retrieval, also known as search, to have substantial impact on diverse types of information in areas from consumer health to clinical medicine to genomics. 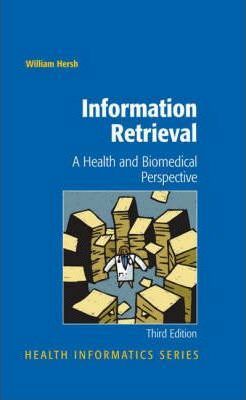 Totally rewritten, this new edition of Information Retrieval: A Health and Biomedical Perspective provides an overview of the theory, practical applications, evaluation, and research directions of all aspects of health and biomedical information retrieval systems. The book is organized into three sections covering basic principles, state of the art systems, and research directions. The book demystifies the jargon and defines where current applications and research systems are heading the field in areas such as digital libraries, linkage to electronic health records, and text mining systems. This book details the technical state-of-the-art and research results in health and biomedical information retrieval. The increasing importance of health information retrieval makes the book an invaluable tool for those involved in this area, such as medical informaticians, computer scientists, library/information scientists, IT developers, and leaders of hospitals, companies, and universities. Basic Concepts.- Terms, Models, Resources, and Evaluation.- Health and Biomedical Information.- State of the Art.- Content.- Indexing.- Retrieval.- Digital Libraries.- Research Directions.- Evaluation.- System and User Research.- Related Topics. William Hersh, M.D. is Professor and Chair of the Department of Medical Informatics & Clinical Epidemiology in the School of Medicine at Oregon Health & Science University (OHSU) in Portland, Oregon. He also has academic appointments in the Division of General Internal Medicine of the Department of Medicine and in the Department of Public Health and Preventive Medicine. Dr. Hersh is a professor and chief of the division of Medical Informatics and Outcomes Research and has developed a course built around the first edition. He has contributed to Shortliffe's Biomedical Informatics in with a chapter on information retrieval.